It’s hard to miss two big events: what happened in November 2011 and April 2012? 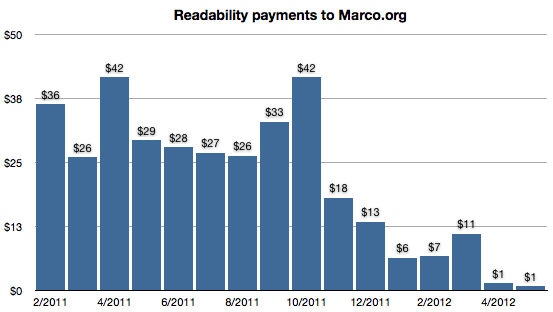 In November 2011, Readability stopped requiring all users to pay and significantly downplayed the payment system, making the entire service free to boost the userbase. In March 2012, the (free) Readability iOS app launched with significant PR, but in April, major competitor Pocket (also free) launched with a lot more features and even bigger PR. The lack of publisher sign-ups wasn’t the only reason this didn’t work. Readability removed the need for people to pay, significantly eroding the income “for publishers”. And they’re no longer the only free option in this market, reducing their visibility and potentially reducing their userbase.